War, conquest, victory, strife, ambition, originality, overweening confidence and megalomania, quarrelsomeness, energy, vigour, stubbornness, impracticability, rashness, ill-temper. Heh means a Window. 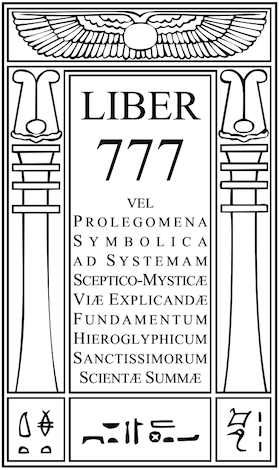 Its Yetsiratic title is "The Constituting Intelligence", and its astrological attribution is Aries, the sign of the Ram, ruled by t Mars, and in which the Sun is exalted. Its attributions are, hence, fiery and martial. Its Gods are Athena, insofar as she protected the State from its enemies; and Shiva and Mars. Minerva is also an attribution, for she was believed to have guided men in war, where victory was to be gained by prudence, courage, and perseverance. The Egyptian Mentu is also a god of War, depicted with the head of a Hawk. The Scandinavian Tyr is an attribution to this Path, for he is the most daring and intrepid of the Gods, and it is he who dispenses valour, courage, and honour in the Wars. The Spear is the weapon appropriate; the flower Geranium, and the jewel Ruby because of its colour. 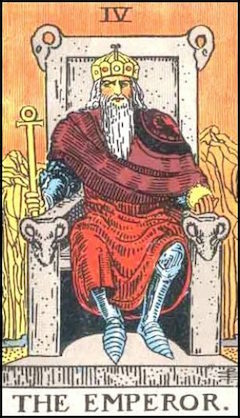 The Tarot card is IV - The Emperor, who has a red robe, and seated on a throne (in his crown are rubies), his legs forming a cross. His arms and head form a triangle. We have, therefore, the alchemical symbol of Sulphur, a fiery energetic principle, the Hindu Gunam of Rajas, the quality of energy and volition. On the arms of his throne are carved two ram's heads, showing that this attribution is harmonious. A tall, dark, restless man, with keen flame-coloured eyes, bearing a sword. A green-clad woman, with one left bare from the ankle to the knee. Cat, toad, man, or all at once. Old man, riding a crocodile and carrying a goshawk. The Son of the Morning, chief among the Mighty.